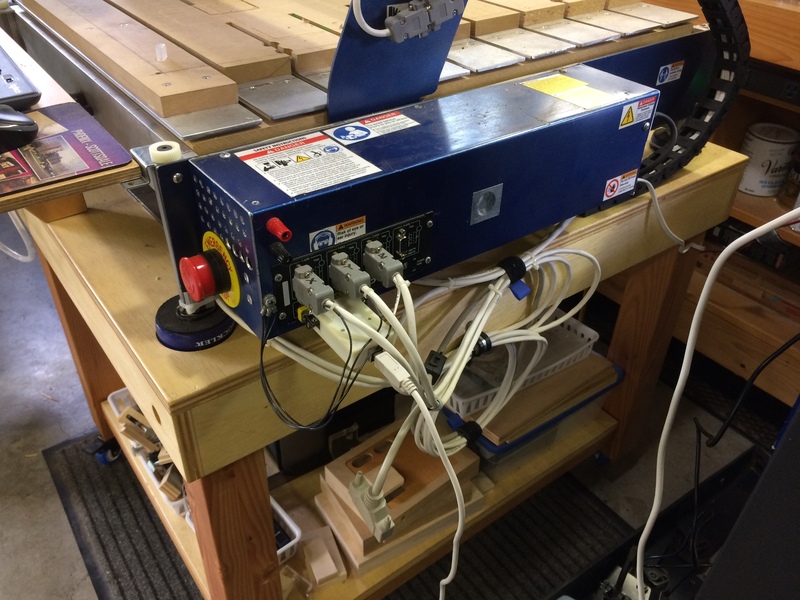 The Gecko G540 4-axis CNC controller has been around for awhile and is very popular. 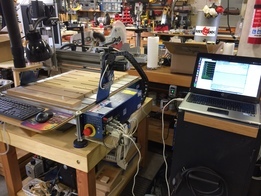 I have many customers using the rt-stepper dongle with the G540, here is a hands on example with a CNC Router using a G540. This system was dedicated to running Mach3 on Windows 7 over a parallel port. One could run no other programs in the background while running Mach3 otherwise missed steps would occur. This means the PC was always run offline - no internet. By replacing Mach3 with the rt-stepper software this allowed us to control the G540 using a normal PC over USB with no runtime limitations. Here is a picture of the rt-stepper dongle plugged into the CNC Router with the Gecko G540 CNC controller. The USB cable is plugged into a notebook with no parallel port. In order to plug the dongle into the G540 DB25 connector a male-to-male gender changer was required. Also the G540 Charge Pump switch must be turned off. The dongle in the picture was an early prototype, the current dongle is smaller. The software that drives the rt-stepper dongle is pymini. The GUI is written in python, so it runs on the three OSs - Windows, Linux and Mac OSX. Software is based on EMC/LinuxCNC, but without the realtime Linux kernel requirement. I'm running pymini with a ini file (dans_gecko540.ini) which should be similar to other Gecko G540 machines. All the software is open source and available at www.ecklersoft.com. 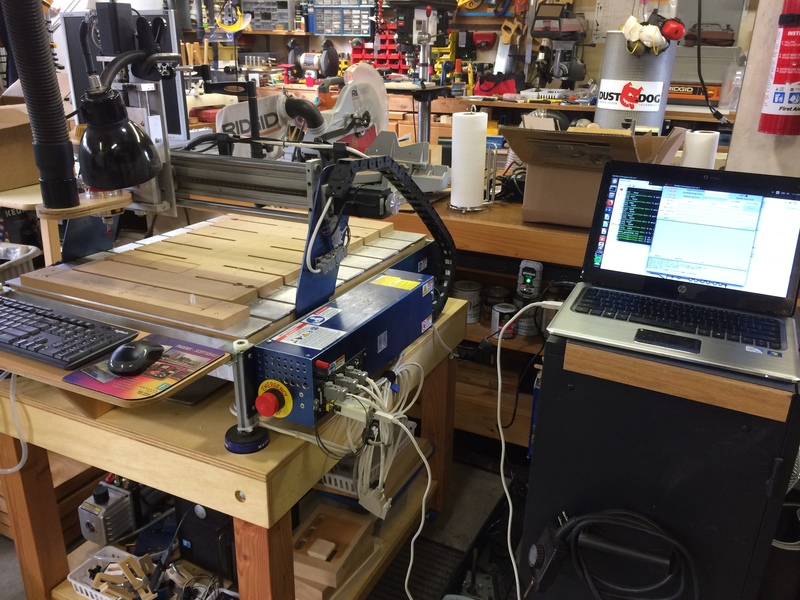 Initially we used my Ubuntu notebook to configure the ini file for the CNC Router. Each axis was set to 4000 steps per inch in the ini file (INPUT_SCALE = 4000). We then followed a tuning procedure in order to determine max velocity setting for each axis. In the ini file the max velocity was set to 240 inches per minute (MAX_VELOCITY = 4.0). When the ini file was complete we then moved the ini file to the Windows 7 PC and installed pymini. Once the pymini driver was installed we could run pymini using the new ini file on Window 7. Here is the CNC Router with the Gecko G540 we used for this example.